Photo found on line with no credit given. Only at Starbucks – Earlier this week, as I drove into my local Starbucks the entrance are was blocked by two cars parked at weird angles and three guys running around with their arms flailing. At first I thought there may have been a fender bender between coffee craving addicts. On second look, I saw that one car and three guys were flagging the other car which had driven out of the parking lot with his coffee on the roof of his car. I thought that only happened on TV! One of my favorite Calvin and Hobbes winter cartoons! All prepared – The weather folks have been ranting all week about a huge storm crossing the country. Some areas have been hit hard. The forecast for our area changed several times as the storm track moved. It was doing a dance as it came east. A little further north, slow down, speed up, do-si-do, swing your partner, sounds like a line dance I don’t do well. Snow has started as I write this but is expected to change to rain at some point. We’ll see how it goes. Bird feeders are full, pantry stocked. Books on hand. Prayer said to the electricity god. We’re good no matter what happens. The end to that story – It’s Sunday morning and the storm petered out here. We got snow but it changed to rain early. I can see the grass through the snow. Better still, the roads were just wet so I did my Starbucks run. If the cold snap isn’t as harsh as they say, I’ll be happy! Down the rabbit hole – Over the past couple of months I have received emails from people who may be distant relatives. We go back and forth checking for a match up. I had one very successful one. My cousin’s granddaughter contacted me. She lives in another state. I knew from the pictures that she belonged in the family. She looks a lot like her grandfather. One other contact may be very distant going back to the early 1800’s. The others didn’t pan out at all. I still find the research interesting and this is the perfect time of the year to go back down that rabbit hole and work on my family tree. I know there was a Neanderthal there somewhere. I intend to find him! Sadly – We lost one of our beloved grandpups this week. In this family they are mourned as any other family member. RIP Penny. This entry was posted in Family Tales, For Animal Lovers Only, Humor, It happens at Starbucks, Other People, Random Five, relatives and tagged ancestors, coffee on roof of car, dogs, pets, storms, weather, weather forecasts by Kate Crimmins. Bookmark the permalink. Much ado about nothing with the snowstorm but a whole lot of rain today. Seems like overtime the temps get mild, rain comes with it. Not complaining about the rain. Less of a headache than snow. Hard to get guys moving so fast so early too. I’m so sorry about Penny. A loss upon a loss. Was she sick? Obviously she was but I didn’t know. She seemed to be trying to hack up a hairball which is why I took her in. Turns out she was having trouble breathing. I totally blew that. I am sorry I didn’t pursue her poop issues with x-rays or ultrasounds. The mass may well have contributed to it although in the end there may not have been anything I could do to change the course. Awful. It’s so hard to know they suffered. But you did your best! I know but I still carry guilt. Had I known, she would have had all the tuna she could eat. Diet be damned. Awww. She had a good life. She did. She slept anywhere she wanted. I didn’t even scoot her off of the dining room table. Awwww. That’s as it should be. Kids down the street built a snow shark instead of a snowman. Their shark is about 10′ long/2′ high with a fin and teeth. It’s cool and makes me wonder if their parents were Calvin and Hobbes fans. That is pretty cool and I would guess the whole family is C&H fans. So glad the storm wasn’t as bad for you as it was supposed to be! 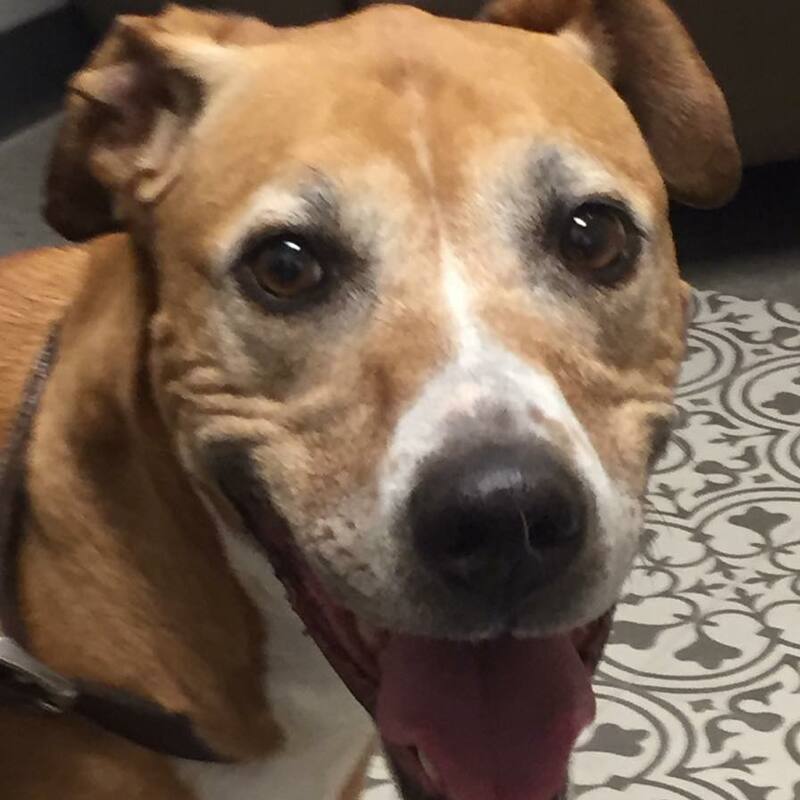 So sorry about the grandpup – your family is getting hit with a lot of these losses lately. There have been a lot of losses, animal and human in the past year. Enough already! We got socked with 6 inches, plus snow drifts. Sounds like it petered out when it got to you. Today the cold snap hit. Woke up to 5 degrees. Ahh, refreshing. 😉 Supposed to get some bad weather tomorrow. So sorry about Penny. My warmest wishes to those grieving. It did peter out but it was 7 degrees this morning. Snow again on Wednesday although I don’t know how much. We’ve been lucky so far. Sorry about Penny, Kate. A very sweet face. I’d love a warm up. Maybe we’ll get one later this week but our warm ups are around 40. First of all – so sorry to hear about Penny. They ARE family. About your heritage hunting – my father is very enthusiastic about this and was tickled pink last week to be contacted by a distant relative (third cousin once removed, if I have calculated correctly) with EXACTLY the information my Dad has been searching for in vain for months, namely, information about his paternal grandparents’ siblings and their descendants.. So now, we’ve discovered a whole bunch of new family members in and around New York. With so much, and so many, lost in the Holocaust, every new discovery is a whole new world. It is exciting. Learning the tricks to research has been enlightening. I started in the late winter last year and I got really neurotic. I would think of a different search method and get up from the dinner table to write it down. Names were spelled differently. There was a lot of maternal death so multiple marriages. I’m lucky I did as well as I did as the area my ancestors came from was relatively rural. The only records were church records. Well, that was a waste of a good mocha. Concerning the storm, sounds like you dodged a big one there, Kate. Sorry about Penny, but you’re right, though, they should be seen as part of the family. At least it wasn’t my coffee! The guy was able to get it before it spilled which was a miracle as he had driven at least 30 ft.
I’m sorry to hear about Penny. Like Hazel it was a shock. A few days of lethargy followed by a devastating diagnosis. I’m so very sorry to hear about Penny. Your family has had some rough times lately with losing beloved pets. 😦 I have a very close friend in Massachusetts who texted me similarly about the weather shifting and changing enough to save them from the worst of predictions. Woo-hoo! I’m glad you could still get to your Starbucks. It adds a little balance to the “hurting” circumstances! It does. Mocha lattes are one of my comfort foods. Sorry to hear about Penny, especially so soon after losing Hazel. The coffee story is hilarious – and so many people trying to save that precious cup of java makes it even funnier. Speaking of funny – I really enjoyed Calvin and Hobbes as well. It was funny because most of the time no one notices. These three guys were yelling and flagging him down for a coffee. Wish I would have recorded it. Weather is weird. Around here one day it is 70* the next 40*. Overall it has been warmer than usual with too much rain. If we get snow everything shuts down and we’re told to stay off the roads. Of course, the grocery stores are packed and they run out of bread and milk and the like. It’s like folks fear that the Donner party saga is going to be replayed. Sorry to hear about Penny. Always hard when family members are no longer with us. Around here we call it the french toast syndrome. The aisles with milk, eggs and bread are completely empty at the hint of any bad weather. We had no snow in our forecast. There was absolutely no indication of flurries on the radar. Light snow fell for at least 10 hours, leaving NOTHING on the ground. The world should envy us!!! I’m glad your storm did not live up to its name. Sounds like you lived in the perfect winter wonderland! All beauty, no bad driving. It’s good that many Southerners stay off the roads when it’s icy. I drove in lots of bad weather in NY, but I don’t have to any longer. For me the beauty of retirement is not worrying about driving to work. For most of my career I worked for an electric utility that never closed. People like their electricity. At one point I had a 40 minute drive and sometimes it was all white knuckle. Now I worry that I can’t make it to my Starbucks which is less than a 5 minute drive on a main road that is always cleared first. You’ve got your worries prioritized. I had a 45-minute drive to work. It was the uncertainty of the weather that bothered me. No matter when I was driving in a storm, it was always the worst possible time. May your path to Starbucks always be clear!!! One time I had to travel about 2 hours with an impending snowstorm. I had to leave at 6 a.m. Nothing locally but when I got through a tunnel to the other side of the mountain on an interstate, It was a white out. White knuckle all the way. Turns out all the locals did not make it. I came from 2 hours away. From that point I always canceled if there was even a chance of bad weather. Fortunately by the time I left in the afternoon, the storm had passed and the roads were cleared. Sorry to hear you have lost a canine friend. Mild weather here so I cannot complain. As long as you can get to Starbucks you are OK! So far the double storm has fizzled so I’m good with that. Haven’t had any trouble getting to SB! Very sad about Penny. Our thoughts to your family. The rabbit hole is fun! I’m sorry for the loss of that cute dog. RIP. Hard for the family that lives with her. So sorry to hear of the loss of Penny, losing animal friends is really hard. Sympathy to all. We’ll see about the cold. The snow didn’t materialize as predicted. I hope the cold is milder too. Got it! Sometimes blogs are wonky. So sorry to hear about Penny. I also love C & H. Actually, my mother once drove with her coffee mug on the roof. We got to the next block and I asked, “why is it pouring brownish on the window?” Next thing we knew, the coffee mug followed. Luckily it didn’t break. It was a hoot! The loss of a pet cannot be overestimated. I have relatives I didn’t/ won’t mourn as much as I do my deceased pets.The household is never the same, and the empty spots are daily reminders. I agree. Losing a pet that lives with you is always more painful than someone you see occasionally. The routine is broken forever and the spots are empty. The storm here was rain and then snow. A lethal combo. And now it’s cold. 12F. Supposed to be a low of 5F. I’m glad it’s the weekend and I can just cuddle up under a comforter. I’m sorry about the pupper. We got snow, then rain. It’s a little windy now which is good. That will dry the streets. Our cold is coming in late today. Sorry about Penny…what a sweet face. We’re getting down to 20 degree tonight, but thankfully no snow, only high winds. Counting the days until spring. Two months to spring! The rain/snow line hovered just below us so our snow turned to rain fast. All good. So sorry about your grandpup! And the storm here was much less than predicted too. Hoping, like you are, that the cold isn’t too harsh or last too long. Sitting here hoping the sun will come out and dry (at least) the roads and wires before the deep freeze. Yes, anxious for Spring too. Hoping everything dries so my routine doesn’t get interrupted. Two months until spring. So sorry to hear Penny has passed away. Weather wise, we’re at 6s and 7s over here. It was freezing cold at 7am and 8.30 when I let Maggie out so after breakfast both of us wrapped up really warm and took her out for her third walk just after 10 as normal. We felt like we were walking saunas! It’s gone totally mild again. Mad. Weather has been wonky. We are expected to drop 30 degrees in 12 hours. At least that’s what they say. Sorry to hear about Penny. Sorry the snow didn’t pan out. I really like a good snow day! My interest in snow has waned. We have a driveway and walkways to shovel and it makes people drive crazy. I was glad it passed us by this round. We’ll get another one before the season is over. I confess. I like snow, ok, but I really love an excuse to work at home with my companion animals….. Snow days with pets was great when I was working. It didn’t happen often enough. Right? My cats and dogs are the perfect coworkers. The parrots, not so much. I love Calvin & Hobbes ~ and snow sharks is hysterical! Too bad you didn’t get enough snow to head out and build your own snow montage! I love the dark humor in C&H. We all have it but try to repress it. Makes me giggle. Not at this point. We live across the country from each other and she has significant health issues. However, we did connect on Facebook and I can follow her journey and keep up with her family. Penny’s photo is beautiful. I’m sure her personality was, too. Sorry to hear. 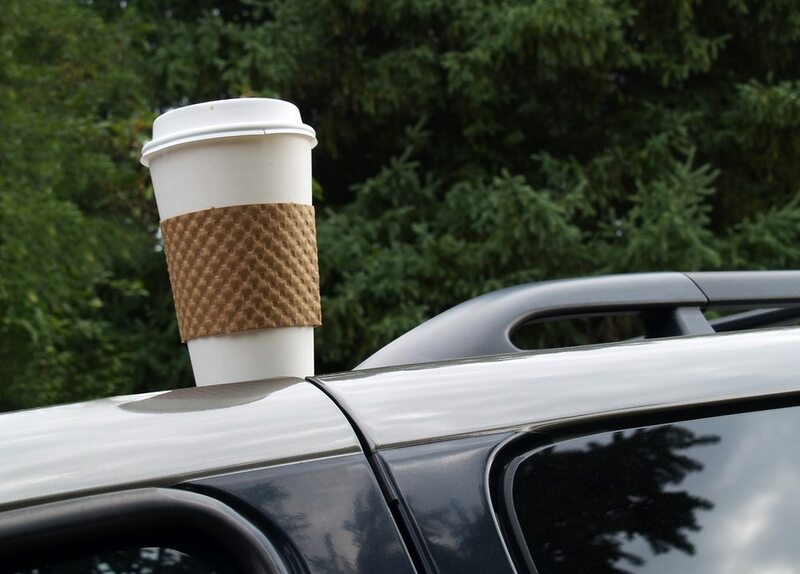 I have myself driven off with coffee on top of the car. And once I helped a neighbor find his favorite travel mug he had left on the top of his car. Sure enough, it was down the road a-ways, off in the ditch. And now your Starbucks driver . . . I’m just glad to know I’m not the only one who has done that! I guess it happens more often than I thought. It is annoying that every bit of normal winter weather is treated like Armageddon by the forecasters. It’s WINTER! We are going to get weather. We didn’t get much snow, but it is bone-chilling cold and what little did fall, it is staying. We had a snowstorm in November that turned into a fiasco. It was supposed to be small but was 7″. It was early so no one was prepared. People were stranded everywhere. Now we are back in the “sky is falling” mode to make sure everyone is prepared. The weather is “iffy” here too. Sunshine this morning but wait a minute. So sorry about Penny. I mourn the dogs I haven’t even met. I’m still healing from the loss of Hazel so any lost pet is painful to me. So sorry about another loss in your fur-family. There has been a lot of loss lately. All kinds. Stopped at the grocery store Thursday, ahead of “the” storm. Was met by many seniors with full carts ~ smiled and chatted with most. We got a fair bit of snow, the first in a long while, and everything is white and sparkly this morning. Sorry for the loss of Penny, I know how much that hurts. Thanks. Penny lived in Denver so I didn’t see her often but she was a really nice dog. The storm sort of missed us but we are expected to get the bitter cold that follows it. The Starbucks story made me laugh. Who said Americans don’t care. Yes we do, sometimes it just comes in a runaway cup. I’m watching my neighbors gearing up for this cold front as if seals are about to arrive by train. My corner market has been packed with people getting in trouble for sneaking into the 12 items or less aisle with. lets say, a few extra must-haves. Okay, I’m all for a couple extra cans of soup on hand, but really. CNN should get a good slap for terrorizing the nation. Sorry about the doggie. Sometimes it’s sadder when the 4-legged depart since, with the exception of a little fur here and there, they selfishly live for you and you alone. There is something to be said for unconditional love. So hard to find except in pets. Agreed. It’s considered passe and a waste of time. A real doggone shame if you ask me. For me ancestry research was addictive. Along with filling out the tree I wanted to know stuff like why did they emigrate, how did they live, what was life like back then. Can’t imagine no running water. That’s what I’m afraid of. I won’t have time for anything else once I start it! I hope the weather doesn’t get too unpleasant for you. Sounds like you are ready ~ stay warm! When we get past Monday and Tuesday, the temps will moderate again. Spring, soon please.